The compelling economic challenge in most major economies is for an improved coordination of policy across reflationary levers, so that policy-makers can tackle the slow burning global growth crisis. The extreme degree of policy coordination – Helicopter money – may be a desired end-state for many economies. There is of course a dark side to such a policy of “inflationary” deficit financing. Emerging markets are replete with examples of central banks under-writing fiscal spending in a manner that has spurred economic dislocation and undermined investment returns. The damage these policies have reaped on various emerging markets stems from the fact that, unlike candidates for helicopter money, many emerging market central banks have monetised fiscal debt at a time when there is no zero bound problem for monetary policy and when the key economic challenges are not insufficient demand and downside risks to inflation. 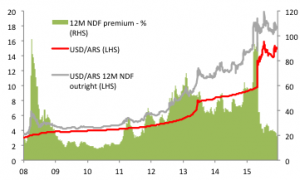 Argentina provides a prime example of the problems of inappropriate inflationary deficit financing. A decade of populist rule left the new President with a legacy of unsustainable budget deficits, high inflation, weak economic growth and an unpredictable regulatory regime. In contrast to many key leading economies, Argentina’s challenge is to disentangle monetary and fiscal policy and thereby return to economic orthodoxy. Reining in the budget deficit is a critical success criterion for the government’s stabilisation plan. While the government faces a daunting economic challenge, the market has expressed confidence in President Macri by maintaining long positions in the country’s Eurobond debt. By contrast, following a maxi-devaluation, sentiment in the ARS remains weak. However, we think that the risk premia on the ARS priced into the FX forward curve is too high since a tight monetary policy and a more stable ARS could be crucial components of a stabilisation plan over the next 12-months. We see value in establishing short-USD/ARS positions, which can potentially bring to investor portfolios a high return trade that is uncorrelated to prevailing market beta.